"A Farewell To Uncle Al"
Al Thoreson with Jerry Hopp in 2008. Veteran Unlimited hydroplane crew chief Al Thoreson passed away this past weekend. He was 86. A generation of race fans knew him as "Uncle Al." During the sport's piston era, Thoreson was regarded as something of a legend–especially among low-budget Allison-powered teams. From the 1950s to the 1990s, Al twisted wrenches for owners Bob Gilliam, Pete LaRock, Bob Fendler, Pat O'Day, Bill McFadden, and others. He was co-owner with Jerry Hopp of the Thor Racing Team, headquartered in Snohomish, Washington. A U.S. Navy veteran, Thoreson was an eye witness to the Japanese surrender to General Douglas MacArthur, aboard the Battleship Missouri, at the end of World War II. After the war, Al raced Stock Cars before drifting into boat racing. His first major involvement with Unlimited hydroplanes was with Bob Gilliam's team, which usually carried the name Fascination when no sponsor was available. In 1959 and 1960, the team received financial backing from Seattle Radio Station KOL and raced as KOLroy. At the 1959 Buffalo Launch Club Regatta on the Niagara River, Thoreson and Gilliam encountered a problem with KOLroy's one and only two-blade propeller. A piece of one fluke had broken off in a test run. The nearest replacement prop was a continent away in Seattle. What did they do? Al and Bob took a hacksaw and cut an equivalent chunk out of the opposite fluke. They then filed down both flukes, put the "butchered" prop back on the boat, and went on to take second in the race behind first-place Maverick and driver Bill Stead. According to Gilliam, KOLroy "had more bounce than it ever had that day and twice the acceleration." 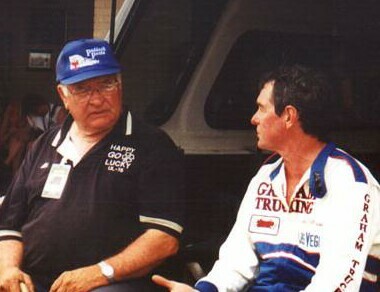 One of Thoreson's most unusual assignments was as crew chief and driver coach for Brenda Jones, the rookie driver of Pat O'Day's Miss KYYX in 1981. Brenda was the first woman to drive in post-World War II Unlimited competition. She had no previous racing experience aside from a couple of practice heats in a stock 145 Cubic Inch Class rig. While the media snickered at the whole idea, Al put Brenda through her paces, calmly and professionally. Brenda passed her Driver's Qualification test with flying colors and did her team proud, both on and off the race course. Thoreson's best season as an Unlimited crew chief was undoubtedly the 1972 campaign. Sponsored by Pizza Pete and driven by Gilliam, the team finished fourth in a 17-boat field in National High Points and qualified for six Final Heats out of seven. The best finishes were a third in the Champion Spark Plug Regatta at Miami and a fourth in the President's Cup at Washington, D.C. This was with a boat that was in its 13th season with a hull design clearly obsolete in comparison to Atlas Van Lines, Pay 'n Pak, and Miss Budweiser. "Uncle Al" will long be remembered for his friendliness and for his many years of hard work and dedication to the sport that he loved.